Not far from the shore of the Sea of Galilee you find Villa Melchett, a stunning building that has preserved the beauty of the old times. The villa once belonged to Lord Melchett, one of Britain’s richest men back in the 1920s when Palestine was under the British Mandate. During a visit the Lord purchased that piece of land and built himself a luxurious mansion. Today, this beautifully decorated villa can be hired as a filming location for filming feature films in Israel or it can serve as a special event for your project. If you are looking into an old, stylish mansion with unique atmosphere and charm, this might just be the perfect location for you. Biblical Productions – your production service provider in Israel. We handle your film project from A – Z and will make sure you only go home with the best footage possible. If you are with a crew and it suits your production schedule, it is recommended that you arrive in Israel on a Saturday. The airport is much quieter then, and you won’t have to endure long lines. Although EL-AL, the Israeli airline, does not fly on Saturday, other companies do. In Israel Saturday is a holyday and Sunday is a full working day. Nazareth Village is located In the center of the town of Nazareth in the north of Israel .Nazareth Village is particularly suited for filming reenactments of stories from the Bible. The village has biblical animals, tents, costumes and stone houses. Among their services, the Nazareth Village the highly experience management team can prepare props for you according to your needs. Also they can schedule men, women and child actors to play biblical figures. There is no need for special permissions! By bringing your crew to one place that caters to your specific Film Production needs, you can save time. 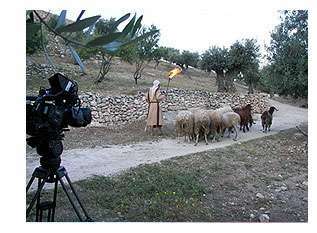 In short, with everything under one roof, Nazareth Village provides a great way to film biblical-related material in Israel. If you need a breath-taking view of Jerusalem, you should drive to the Mount of Olives cemetery. From the Gat Semannie Garden continue a few meters up the hill and take the first turn to the right. A narrow road will then take you to the cemetery where you will discover the beauty of Jerusalem. This is probably the dirtiest hotel you’ll ever find in Jerusalem. Why do I mention this? The place has a roof with a really great view. If you need beautiful shoots of Jerusalem, this is the place to go. They charge 5 shekels to see the roof, and permission to shoot from it depends on who is working at the time. It’s all a matter of bargaining like the market. It can cost 50 shekels to US$ 100. If you aren’t happy with the price, the desk clerk will let you speak to Bashir, the owner. He is a reasonable man who wants to do business. The view is spectacular. Neot Kedumim, a biblical landscape reserve, is the perfect spot if you are looking to film biblical scenery. Located half way between Jerusalem and Tel Aviv, this vast artificial garden is complete with biblical plants and animals and additionally provides demonstrations on ancient agricultural methods. If you need general footage for biblical-looking shots we recommend filming here. People frequently ask me when they can film the procession of the priests in the Via Dolorosa. So here is my tip – every Friday at 4:00pm the procession begins from the Church of Flagellation next to the Lion’s Gate. The procession through nine stations of the Via Dolorosa, includes the Franciscan priests dressed in brown robes, walking with pilgrims from around the world with crosses on their backs, singing and praying. The procession ends after around an hour at the Church of the Holy Sepulchre where there are the last five stations. This walk is most impressive on Easter but takes place every week on a smaller scale. JPS – They import tapes of all types. Doron, the owner, is reliable and if you buy more than 10 tapes, he will probably deliver them himself. Eldan and Avis are both good companies. Ask for the Business Department and negotiate the rental fee. Alan adventure tours: Air conditioned closed jeeps mountain bikes (including shock absorbers), gliding and climbing equipment, rappelling with licensed instructors, paintball guns, target shooting with bows and arrows, Omega gliding, wall-climbing equipment, and shaded sheds and equipment for children’s workshops, field amplification and lighting systems, catering equipment for refreshment stands and receptions. Contact: P.O.B. 827, Mizpe Ramon, Israel 80600. Tel.08-6595555; Fax.08-6586273. Many in the industry work with David Shani. He is reliable. Reproductions of archaeological artifacts and other items in the Museum’s collection (and the collections of other Israeli museums), metal and ceramic statuettes, glass and metal paperweights, glassware and silver jewelry Catalogues: a wide assortment of catalogues of exhibits at the Eretz Israel Museum, Tel Aviv, and other Israeli museums. The catalogues cover various topics, including archaeology, pottery, glass, ethnography, Israeli life, and the history of Tel Aviv. Posters on Israeli themes, Israeli artists, Tel Aviv, ancient maps, inscriptions, books, postcards, greeting cards, house-blessing plaques. Jewelry: a large selection of jewelry crafted by the leading silversmiths in Israel. Classic Jewelry: reproductions, original Yemenite silver jewelry, jewelry with Roman glass, jewelry with ancient coins. Modern Jewelry: crafted in gold, silver, and other materials – metal, glass, plastic, and wood. Ceramics: a great variety of ceramic vessels, statuettes, and bowls produced by leading Israeli ceramicists, as well as original Armenian ceramics from the Balian workshop in Jerusalem. Glass: original glassware, bowls, decorative plates, pitchers, and statuettes. Toys and Games: in an Israeli vein – mosaic kits, restoration of archaeological artifacts, mobiles, puzzles, and hobby kits. Textiles: tablecloths, napkins, bags and purses with local designs, original Bedouin embroidery, t-shirts printed with Israeli themes in all sizes. Silk scarves with original patterns, textiles for Shabbat and festivals – hand embroidered and printed halla covers, matza covers, and afikomen covers. Judaica: silver candlesticks, wine goblets, and Torah pointers in both classic and modern designs, home-blessing plaques, prayer books and Bibles in artistic and leather bindings, a huge selection of mezuzot made of silver, glass, wood, metal, and stone, hand-woven tallitot. Hanukkah menorahs made of various materials and in a range of sizes, in both traditional and modern designs. Dreidels made of various materials, including silver, other metals, wood, glass, plastic Seder plates and matza holders, in both traditional and modern styles. Need to shop in Jerusalem? If you want to bring home souvenirs, then your best bet is to buy them in the Arab Market (“Souk”) in the Old City. For modern stuff, I recommend the Malcha Mall. It’s easy to get to and there’s lots of parking. One thing you do not want to do is to go shopping in the center of Jerusalem. No parking and the shops are really “bad!” Until an improvement, just go to the Malta Mall when you need to buy. Off of the Via Dolorosa you can find this intriguing shop that sells ancient artifacts and jewelry. When you walk into the shop, proudly hanging on the wall are pictures of Moshe Dayan and a letter from Bill Clinton. According to the owner, the famed archeologist Eliezer Sukenik was also once in the shop. For a fascinating shopping experience, and for those with an interest in archeological items, this shop is worth your while. Need to shop in Tel Aviv? Shankin Street caters to young, upward mobile Israelis with extra shekels in their jeans. Don’t expect to find high fashion here, but if you shop on Shankin Street, you’ll definitely be in style with your contemporaries. The atmosphere is great, especially on Friday afternoon. Nice coffee shops and restaurants are not far from the vegetable market and Nachlat Ben Yamin, a very authentic part of downtown Tel Aviv. If you need to get shoots of modern Israel, bring your camera on Friday afternoon. It’s all out there. Ramat Aviv Mall is considered to be Israel’s best mall. Under one roof, you’ll find a variety of top designer fashions and a wide range of prices. A great place to film and visit. Jaffo can be described as a typical small Mediterranean town. Although part of Tel Aviv, Jaffo is about a 10-minute drive away from the center of Tel Aviv. In the middle of town there is a market for souvenirs and furniture. Highly recommended. If you are looking for a modern model of Jerusalem, the Jerusalem Municipality recently opened to the public a precisely detailed model built on a 1:500 ration, covering 40 meters. It was built, in part to give architects a tool to work with and therefore it is somewhat a model of Jerusalem in the future. There are tours available for individuals every Monday at 10:00. Grous need to organize in advance – 02-629-5981, 02-629-7885. The Jerusalem Municipality building is located in Safra Square off of Jaffa Road, in the center of the city. Ozen Hashlishit or “The Third Ear” is the foremost DVD/Music store in Israel for those with an interest in film beyond the staple Hollywood flicks you can find at chains like Blockbuster Video. With branches in Jerusalem, Tel Aviv, and Haifa, the store, that some simply refer to as Ozen, is well-stocked with thousands of movie titles for rent and sale, as well as an interesting selection of music and books. Recently the store has expanded its activities and added screening rooms in the Jerusalem and Tel Aviv branches, which offer, for low prices, viewings of alternative films that do not make it to local theaters. The halls are also available to rent for private screenings. We recommend Ozen because it is the ideal place to rent a DVD if you are looking for something specific, and the only place if you are looking for something out of the ordinary.